Since Cooper's time, numerous articles have gradually raised physician awareness of this condition. In 1952, Harrison McLaughlin defined posterior dislocation as a "diagnostic trap," and others have used equally foreboding descriptions. Even today, the diagnosis of posterior shoulder dislocation continues to be missed or diagnosed late, after the patient has undergone unsuccessful and often painful therapy for adhesive capsulitis. McLaughlin also stated that "the clinical diagnosis is clear-cut and unmistakable, but only when the posterior subluxation is suspected." It also might be said that knowledge of a particular diagnosis statistically increases the likelihood of the clinician making that diagnosis. For some acute dislocations, Wilson and McKeever recommended that a Velpeau bandage be applied with the patient's shoulder fully internally rotated and with the forearm lying across the small of the patient's back (a position now commonly used at the beginning of the liftoff test for subscapularis function). Posterior glenohumeral instability is much less common than anterior instability. However, the condition has been recognized with increased frequency; this may be due to improved awareness of the entity, an increasingly athletic population, or both. In early reports of posterior instability, the terminology of instability was confusing, and chronic locked posterior dislocations were often combined with recurrent instabilities. Each of these conditions has provided physicians with a dilemma not only in diagnosis but also in formulating an ideal treatment plan. The symptoms of posterior instability may mimic those of other disorders, and because complete dislocation does not always occur, the diagnosis cannot be confirmed readily with radiographs. Advances in arthroscopic techniques hold interesting potential for the management of posterior instability. Long-term studies, however, are not yet available. Another area of interest has been thermal capsulorrhaphy for instability of the shoulder. [9, 10] Many authors have described techniques for arthroscopic capsular shrinkage procedures for shoulder instability; however, no outcome studies are available yet for the treatment of isolated posterior instability. This approach may hold promise as an isolated procedure or in combination with other arthroscopic techniques. Short-term results have been encouraging, but longer-term follow-up and published, peer-reviewed studies are required. The anatomy relevant to surgical treatment for posterior shoulder instability is related to the posterior approach to the glenohumeral joint. Two general posterior approaches to the glenohumeral joint have been described. In 1944, Rowe and Yee presented a posterior approach to the shoulder using a linear incision over the entire length of the scapular spine, extending to the posterior corner of the acromion. The origin of the deltoid on the scapular spine is identified and detached from lateral to medial. The interval between the infraspinatus and the teres minor is defined and retracted to expose the posterior aspect of the joint capsule. In 1993, Wirth et al described the posterior deltoid-splitting approach to the shoulder. Their technique allows preservation of the deltoid origin from the scapular spine and posterior acromion. (In more traditional posterior approaches to the shoulder joint, part or all of the origin of the deltoid is detached.) This approach therefore maintains the strength and function of the posterior deltoid. 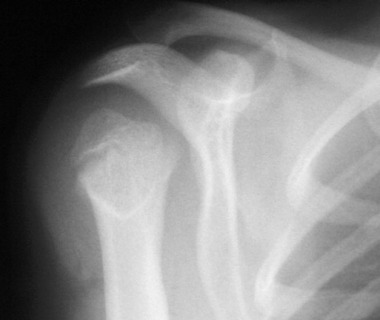 Several structures are at risk during the posterior dissection of the shoulder. The axillary nerve runs through the quadrilateral space beneath the teres minor and can be injured if the interval between the infraspinatus and the teres minor is not critically defined. The suprascapular nerve passes around the base of the spine of the scapula as it runs from the supraspinatus fossa to the infraspinatus fossa. The infraspinatus must not be retracted forcefully too far medially during the approach, because a neurapraxia may result from stretching the nerve around the unyielding lateral edge of the scapular spine. The posterior circumflex humeral artery runs with the axillary nerve in the quadrilateral space beneath the inferior border of the teres minor muscle. Damage to this artery leads to hemorrhaging that is difficult to control; injury to the artery can be avoided by staying in the correct intermuscular plane. Computed tomography (CT) arthrogram of a shoulder with atraumatic posterior instability demonstrates a patulous posterior capsule consistent with excessive capsular laxity. An alteration of one or more of these stabilizing forces, therefore, contributes to posterior instability. Labral lesions have also been described in the impact athlete in whom the posterior glenohumeral compressive force is increased. This causes a greater resultant shear force imparted to the posterior labrum and articular surfaces with forced translation. Arthroscopic examination of a patient with recurrent posterior instability reveals significant fraying and tearing of the posterior labrum. An isolated pathologic lesion responsible for posterior instability is rare. Posterior instability is typically multifactorial in nature, and accurately identifying all the causative agents preoperatively is difficult. The operating surgeon must be aware of all potential pathophysiologic clues so that when identified during the operative procedure, these causes can be corrected. An absolute definition of shoulder instability is difficult to formulate and has been the center of a vast amount of research. Whereas isolated traumatic dislocations can be described by their relationship to the bony landmarks of the shoulder, instability without formal dislocation may be much more difficult to ascertain. One must differentiate between shoulder laxity, which is a physiologic variant of normal, and shoulder instability, which is a symptomatic, pathologic process. In the third category, the voluntary group was subdivided into the habitual (willful) subluxation secondary to personality disorder and subluxation caused by voluntary muscle control. The involuntary group was subdivided into positional (not willful but demonstrated by the patient) and nonpositional (not demonstrable by the patient). Instability or subluxation of the glenohumeral joint has been simply classified according to whether it results from a traumatic or a nontraumatic injury. It can be subdivided into voluntary and involuntary cases. The direction of instability also has been used to classify the pathology. The direction of instability can be unidirectional (posterior only), bidirectional (posterior and inferior), or multidirectional (posterior, inferior, and anterior) and is important to determine in planning the surgical approach. Major injury of the glenohumeral joint can occur directly or indirectly to the shoulder. Pure, isolated, unidirectional posterior subluxation of the glenohumeral joint is rare. [40, 16] Most cases have either an inferior component (bidirectional) or inferior and anterior components (multidirectional), secondary to generalized ligamentous laxity or to repetitive microtrauma causing either stretching of the static restraints or weakness of the dynamic restraints. Because of differences regarding classification and terminology, most studies have combined groups of patients with trauma, multidirectional laxity, unidirectional or multidirectional instability, voluntary subluxation, and intentional or positional instability. Consequently, the results of treatment are often not reported for one well-defined variant of the condition. The rates of recurrence after a posteroinferior capsular shift procedure for posterior instability are higher than the rates of repair for anterior instability. Nonetheless, most shoulders improve from the procedure, and the patients are satisfied. The rate of recurrence after a posteroinferior capsular shift performed as a posterior revision operation is prohibitive when the infraspinatus or the deltoid has been damaged. [22, 53] The best procedure for posterior instability, however, is currently unknown; the technique, therefore, must be individualized to the specific needs of the patient. Within the context of a 2- to 5-year follow-up, reduction of posterior shoulder dislocation in younger children appears to be associated with improved shoulder motion and function. Hoffer has recommended that in such situations, reduction of the shoulder joint should be accompanied by release of the pectoralis major and transfer of the latissimus dorsi and the teres major. [54, 55] In older children (Hoffer suggests age 7 years as a possible threshold), rotational osteotomy is an option. The images below illustrate the anteroposterior (AP), scapular-Y, and axillary radiographs of the right shoulder of a 7-year-old girl with severe upper brachial plexus palsy. Note the marked glenohumeral dysplasia and frank posterior shoulder dislocation. The child's severe loss of shoulder motion prevented her from performing many activities, including combing her own hair. Anteroposterior radiograph of 7-year-old girl with brachial plexus palsy. After rotational osteotomy her function (including the ability to comb her hair) was significantly improved (see the images below). Postoperative anteroposterior radiograph showing healed osteotomy site. Cooper A. A Treatise on Dislocations and Fractures of the Joints. Philadelphia: Lea & Blanchard; 1822.
Cooper A. On the dislocation of the os humeri upon the dorsum scapula, and upon fractures near the shoulder joint. Guy's Hosp Rep. 1839. 4:265-84. McLaughlin HL. Posterior dislocation of the shoulder. J Bone Joint Surg Am. 1952 Jul. 24-A-3:584-90. [Medline]. Malgaigne JF. Traites des fractures et des luxations. Paris: JB Bailliere; 1855. Neer CS, Rockwood CA. Fractures and dislocation of the shoulder. Rockwood CA, Green DP, eds. Fractures. Philadelphia: JB Lippincott; 1975. 686-7. McLaughlin, HL. Locked posterior subluxation of the shoulder: diagnosis and treatment. Surg Clin North Am. 1963 Dec. 43:1621-2. [Medline]. WILSON JC, McKEEVER FM. Traumatic posterior dislocation of the humerus. J Bone Joint Surg Am. 1949 Jan. 31A (1):160-72. [Medline]. Duerr RA, Christoforetti JJ. Arthroscopic Repair of Posterior Glenohumeral Capsular Rupture With Concomitant Anterior and Posterior Labrum Detachment. Arthrosc Tech. 2016 Aug. 5 (4):e865-e869. [Medline]. Giffin JR, Annunziata CC, Bradley JP. Thermal capsulorrhaphy for instability of the shoulder: multidirectional and posterior instabilities. Instr Course Lect. 2001. 50:23-8. [Medline]. Hawkins RJ, Krishnan SG, Karas SG, Noonan TJ, Horan MP. 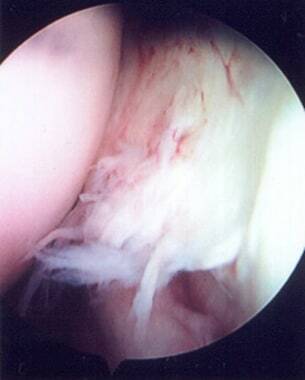 Electrothermal arthroscopic shoulder capsulorrhaphy: a minimum 2-year follow-up. Am J Sports Med. 2007 Sep. 35(9):1484-8. [Medline]. Moroder P, Scheibel M. ABC classification of posterior shoulder instability. Obere Extrem. 2017. 12 (2):66-74. [Medline]. Rowe CR, Yee LBK. A posterior approach to the shoulder joint. J Bone Joint Surg. 1944. 26(3):580. Wirth MA, Butters KP, Rockwood CA Jr. The posterior deltoid-splitting approach to the shoulder. Clin Orthop Relat Res. 1993 Nov. (296):92-8. [Medline]. Brewer BJ, Wubben RC, Carrera GF. Excessive retroversion of the glenoid cavity. A cause of non-traumatic posterior instability of the shoulder. J Bone Joint Surg Am. 1986 Jun. 68(5):724-31. [Medline]. Hurley JA, Anderson TE, Dear W, et al. Posterior shoulder instability. Surgical versus conservative results with evaluation of glenoid version. Am J Sports Med. 1992 Jul-Aug. 20(4):396-400. [Medline]. Neer CS 2nd. Dislocations. Neer CS 2nd, ed. Shoulder Reconstruction. Philadelphia: WB Saunders; 1990. 273-362. Neer CS 2nd, Foster CR. Inferior capsular shift for involuntary inferior and multidirectional instability of the shoulder. A preliminary report. J Bone Joint Surg Am. 1980 Sep. 62(6):897-908. [Medline]. Pagnani MJ, Warren RF. Stabilizers of the glenohumeral joint. J Shoulder Elbow Surg. 1994 May. 3 (3):173-90. [Medline]. Warren RF, Kornblatt IB, Marchand R. Static factors affecting posterior shoulder stability. Orthop Trans. 1989. 8:89. Pollock RG, Bigliani LU. Recurrent posterior shoulder instability. Diagnosis and treatment. Clin Orthop Relat Res. 1993 Jun. (291):85-96. [Medline]. Bigliani LU, Pollock RG, Soslowsky LJ, et al. Tensile properties of the inferior glenohumeral ligament. J Orthop Res. 1992 Mar. 10(2):187-97. [Medline]. Bigliani LU, Pollock RG, McIlveen SJ, et al. Shift of the posteroinferior aspect of the capsule for recurrent posterior glenohumeral instability. J Bone Joint Surg Am. 1995 Jul. 77(7):1011-20. [Medline]. Boyd HB, Sisk TD. Recurrent posterior dislocation of the shoulder. J Bone Joint Surg Am. 1972 Jun. 54(4):779-86. [Medline]. Fronek J, Warren RF, Bowen M. Posterior subluxation of the glenohumeral joint. J Bone Joint Surg Am. 1989 Feb. 71(2):205-16. [Medline]. Schwartz E, Warren RF, O'Brien SJ, et al. Posterior shoulder instability. Orthop Clin North Am. 1987 Jul. 18(3):409-19. [Medline]. Blasier RB, Soslowsky LJ, Malicky DM, et al. Posterior glenohumeral subluxation: active and passive stabilization in a biomechanical model. J Bone Joint Surg Am. 1997 Mar. 79(3):433-40. [Medline]. Bowen MK, Warren RF. Ligamentous control of shoulder stability based on selective cutting and static translation experiments. Clin Sports Med. 1991 Oct. 10(4):757-82. [Medline]. O'Brien SJ, Neves MC, Arnoczky SP, et al. The anatomy and histology of the inferior glenohumeral ligament complex of the shoulder. Am J Sports Med. 1990 Sep-Oct. 18(5):449-56. [Medline]. Lazarus MD, Sidles JA, Harryman DT, et al. Effect of a chondral-labral defect on glenoid concavity and glenohumeral stability. A cadaveric model. J Bone Joint Surg Am. 1996 Jan. 78(1):94-102. [Medline]. Lippitt S, Matsen F. Mechanisms of glenohumeral joint stability. Clin Orthop Relat Res. 1993 Jun. (291):20-8. [Medline]. Castagna A, Conti M, Garofalo R. Soft tissue-based surgical techniques for treatment of posterior shoulder instability. Obere Extrem. 2017. 12 (2):82-89. [Medline]. Harryman DT, Sidles JA, Harris SL, et al. The role of the rotator interval capsule in passive motion and stability of the shoulder. J Bone Joint Surg Am. 1992 Jan. 74(1):53-66. [Medline]. Curl LA, Warren RF. Glenohumeral joint stability. Selective cutting studies on the static capsular restraints. Clin Orthop Relat Res. 1996 Sep. (330):54-65. [Medline]. Beltran J, Rosenberg ZS, Chandnani VP, et al. Glenohumeral instability: evaluation with MR arthrography. Radiographics. 1997 May-Jun. 17(3):657-73. [Medline]. Mitchell JJ, Vap AR, Sanchez G, Liechti DJ, Chahla J, Moatshe G, et al. Concomitant Reverse Hill-Sachs Lesion and Posterior Humeral Avulsion of the Glenohumeral Ligament: Treatment With Fresh Talus Osteochondral Allograft and Arthroscopic Posterior Humeral Avulsion of the Glenohumeral Ligament and Labrum Repair. Arthrosc Tech. 2017 Aug. 6 (4):e987-e995. [Medline]. Mair SD, Zarzour RH, Speer KP. Posterior labral injury in contact athletes. Am J Sports Med. 1998 Nov-Dec. 26(6):753-8. [Medline]. Matsen FA, Thomas SC, Rockwood CA. Glenohumeral instability. Rockwood CA, Matsen FA, eds. The Shoulder. Philadelphia: WB Saunders; 1990. 526-622. Hawkins RJ, McCormack RG. Posterior shoulder instability. Orthopedics. 1988 Jan. 11(1):101-7. [Medline]. Dimon JH 3rd. 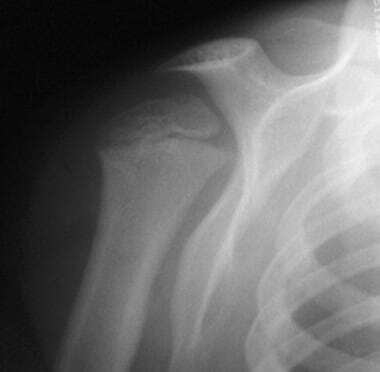 Posterior dislocation and posterior fracture dislocation of the shoulder: a report of 25 cases. South Med J. 1967 Jun. 60(6):661-6. [Medline]. Bigliani LU, Endrizzi DP, McIlveen SJ. Operative management of posterior shoulder instability. Orthop Trans. 1989. 13:232. Troum S, Floyd WE 3rd, Waters PM. Posterior dislocation of the humeral head in infancy associated with obstetrical paralysis. A case report. J Bone Joint Surg Am. 1993 Sep. 75(9):1370-5. [Medline]. Waters PM, Smith GR, Jaramillo D. Glenohumeral deformity secondary to brachial plexus birth palsy. J Bone Joint Surg Am. 1998 May. 80(5):668-77. [Medline]. Pearl ML, Edgerton BW. Glenoid deformity secondary to brachial plexus birth palsy. J Bone Joint Surg Am. 1998 May. 80(5):659-67. [Medline]. Hawkins RJ, Koppert G, Johnston G. Recurrent posterior instability (subluxation) of the shoulder. J Bone Joint Surg Am. 1984 Feb. 66(2):169-74. [Medline]. Tibone JE, Bradley JP. The treatment of posterior subluxation in athletes. Clin Orthop Relat Res. 1993 Jun. (291):124-37. [Medline]. Wolf EM, Eakin CL. Arthroscopic capsular plication for posterior shoulder instability. Arthroscopy. 1998 Mar. 14(2):153-63. [Medline]. Lanzi JT Jr, Chandler PJ, Cameron KL, Bader JM, Owens BD. Epidemiology of Posterior Glenohumeral Instability in a Young Athletic Population. Am J Sports Med. 2017 Sep 1. 363546517725067. [Medline]. Frank RM, Romeo AA, Provencher MT. Posterior Glenohumeral Instability: Evidence-based Treatment. J Am Acad Orthop Surg. 2017 Sep. 25 (9):610-623. [Medline]. Antoniou J, Duckworth DT, Harryman DT. Capsulolabral augmentation for the management of posteroinferior instability of the shoulder. J Bone Joint Surg Am. 2000 Sep. 82(9):1220-30. [Medline]. Antoniou J, Harryman DT. Arthroscopic posterior capsular repair. Clin Sports Med. 2000 Jan. 19(1):101-14, vi-vii. [Medline]. Antoniou J, Harryman DT 2nd. Posterior instability. Orthop Clin North Am. 2001 Jul. 32 (3):463-73, ix. [Medline]. Savoie FH 3rd, Holt MS, Field LD, Ramsey JR. Arthroscopic management of posterior instability: evolution of technique and results. Arthroscopy. 2008 Apr. 24(4):389-96. [Medline]. Fuchs B, Jost B, Gerber C. Posterior-inferior capsular shift for the treatment of recurrent, voluntary posterior subluxation of the shoulder. J Bone Joint Surg Am. 2000 Jan. 82(1):16-25. [Medline]. Hoffer MM, Phipps GJ. Closed reduction and tendon transfer for treatment of dislocation of the glenohumeral joint secondary to brachial plexus birth palsy. J Bone Joint Surg Am. 1998 Jul. 80(7):997-1001. [Medline]. Hoffer MM. The shoulder in neonatal brachial palsy. Clin Orthop Relat Res. 1999 Nov. (368):101-4. [Medline]. Kirkos JM, Papadopoulos IA. Late treatment of brachial plexus palsy secondary to birth injuries: rotational osteotomy of the proximal part of the humerus. J Bone Joint Surg Am. 1998 Oct. 80(10):1477-83. [Medline]. DeLong JM, Jiang K, Bradley JP. Posterior Instability of the Shoulder: A Systematic Review and Meta-analysis of Clinical Outcomes. Am J Sports Med. 2015 Jul. 43 (7):1805-17. [Medline]. Rowe CR, Zarins B. Chronic unreduced dislocations of the shoulder. J Bone Joint Surg Am. 1982 Apr. 64(4):494-505. [Medline]. Gerber C, Ganz R. Clinical assessment of instability of the shoulder. With special reference to anterior and posterior drawer tests. J Bone Joint Surg Br. 1984 Aug. 66(4):551-6. [Medline]. [Full Text]. Nicholson GP. Surgical management of posterior instability in the athlete. Sports Med Arthroscopy Review. 2000. 8:280-8. Shah N, Tung GA. Imaging signs of posterior glenohumeral instability. AJR Am J Roentgenol. 2009 Mar. 192(3):730-5. [Medline]. Simeone FJ, Gill CM, Taneja AK, Torriani M, Bredella MA. Glenohumeral position during CT arthrography with arthroscopic correlation: optimization of diagnostic yield. Skeletal Radiol. 2017 Jun. 46 (6):769-776. [Medline]. Grasso RF, Faiella E, Cimini P, Cazzato RL, Luppi G, Martina F, et al. Direct magnetic resonance (MR) shoulder arthrography: posterior approach under ultrasonographic guidance and abduction (PAUGA). Radiol Med. 2013 Aug. 118 (5):806-15. [Medline]. Galvin JW, Parada SA, Li X, Eichinger JK. Critical Findings on Magnetic Resonance Arthrograms in Posterior Shoulder Instability Compared With an Age-Matched Controlled Cohort. Am J Sports Med. 2016 Dec. 44 (12):3222-3229. [Medline]. Demehri S, Hafezi-Nejad N, Fishman EK. Advanced imaging of glenohumeral instability: the role of MRI and MDCT in providing what clinicians need to know. Emerg Radiol. 2017 Feb. 24 (1):95-103. [Medline]. Burkhead WZ Jr, Rockwood CA Jr. Treatment of instability of the shoulder with an exercise program. J Bone Joint Surg Am. 1992 Jul. 74(6):890-6. [Medline]. Rowe CR, Pierce DS, Clark JG. Voluntary dislocation of the shoulder. A preliminary report on a clinical, electromyographic, and psychiatric study of twenty-six patients. J Bone Joint Surg Am. 1973 Apr. 55(3):445-60. [Medline]. Dunkerton MC. Posterior dislocation of the shoulder associated with obstetric brachial plexus palsy. J Bone Joint Surg Br. 1989 Nov. 71(5):764-6. [Medline]. [Full Text]. McIntyre K, Bélanger A, Dhir J, Somerville L, Watson L, Willis M, et al. Evidence-based conservative rehabilitation for posterior glenohumeral instability: A systematic review. Phys Ther Sport. 2016 Nov. 22:94-100. [Medline]. Engle RP, Canner GC. Posterior shoulder instability: approach to rehabilitation. J Orthop Sports Phys Ther. 1989. 10 (12):1-494. [Medline]. Hawkins RJ, Neer CS 2nd, Pianta RM, Mendoza FX. Locked posterior dislocation of the shoulder. J Bone Joint Surg Am. 1987 Jan. 69(1):9-18. [Medline]. Gerber C, Lambert SM. Allograft reconstruction of segmental defects of the humeral head for the treatment of chronic locked posterior dislocation of the shoulder. J Bone Joint Surg Am. 1996 Mar. 78(3):376-82. [Medline]. Pritchett JW, Clark JM. Prosthetic replacement for chronic unreduced dislocations of the shoulder. Clin Orthop Relat Res. 1987 Mar. (216):89-93. [Medline]. Cheng SL, Mackay MB, Richards RR. 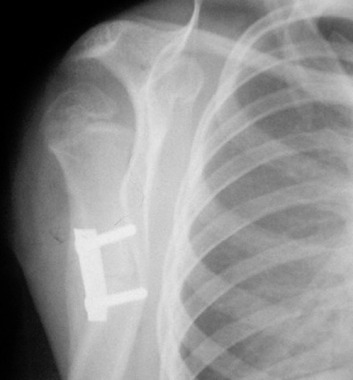 Treatment of locked posterior fracture-dislocations of the shoulder by total shoulder arthroplasty. J Shoulder Elbow Surg. 1997 Jan-Feb. 6(1):11-7. [Medline]. SEVERIN E. Anterior and posterior recurrent dislocation of the shoulder: the Putti-Platt operation. Acta Orthop Scand. 1953. 23 (1):14-22. [Medline]. DePalma AF. Unstable glenohumeral joint. DePalma AF, ed. Surgery of the Shoulder. Philadelphia: Lippincott-Raven; 1983. 512-558. Scott DJ Jr. Treatment of recurrent posterior dislocations of the shoulder by glenoplasty. Report of three cases. J Bone Joint Surg Am. 1967 Apr. 49(3):471-6. [Medline]. Servien E, Walch G, Cortes ZE, Edwards TB, O'Connor DP. Posterior bone block procedure for posterior shoulder instability. Knee Surg Sports Traumatol Arthrosc. 2007 Sep. 15(9):1130-6. [Medline]. Struck M, Wellmann M, Becher C, Pastor MF, Smith T. Results of an open posterior bone block procedure for recurrent posterior shoulder instability after a short- and long-time follow-up. Knee Surg Sports Traumatol Arthrosc. 2016 Feb. 24 (2):618-24. [Medline]. Fried A. Habitual posterior dislocation of the shoulder joint: a report on five operated cases. Acta Orthop Scand. 1949. 18:329. Cziffer E, Habel T, Kepes P. Posterior shoulder dislocation: pitfalls and perils. Orthopedics. 1993 Jan. 16(1):97-9. [Medline]. Chaudhuri GK, Sengupta A, Saha AK. Rotation osteotomy of the shaft of the humerus for recurrent dislocation of the shoulder: anterior and posterior. Acta Orthop Scand. 1974. 45(2):193-8. [Medline]. Surin V, Blåder S, Markhede G, Sundholm K. Rotational osteotomy of the humerus for posterior instability of the shoulder. J Bone Joint Surg Am. 1990 Feb. 72(2):181-6. [Medline]. Keppler P, Holz U, Thielemann FW, et al. 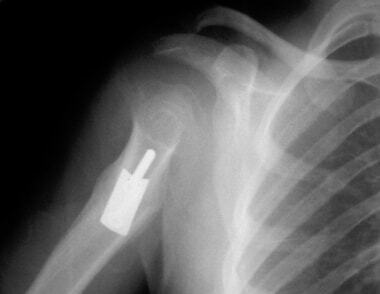 Locked posterior dislocation of the shoulder: treatment using rotational osteotomy of the humerus. J Orthop Trauma. 1994 Aug. 8(4):286-92. [Medline]. Nobuhara K, Ikeda H. Rotator interval lesion. Clin Orthop Relat Res. 1987 Oct. (223):44-50. [Medline]. Brems JJ. Anterior approach to posterior instability. J Shoulder Elbow Surg. 1993. 2(1):S26. Wirth MA, Groh GI, Rockwood CA Jr. Capsulorrhaphy through an anterior approach for the treatment of atraumatic posterior glenohumeral instability with multidirectional laxity of the shoulder. J Bone Joint Surg Am. 1998 Nov. 80(11):1570-8. [Medline]. McIntyre LF, Caspari RB, Savoie FH 3rd. The arthroscopic treatment of posterior shoulder instability: two-year results of a multiple suture technique. Arthroscopy. 1997 Aug. 13(4):426-32. [Medline]. Bradley JP, Baker CL 3rd, Kline AJ, et al. Arthroscopic capsulolabral reconstruction for posterior instability of the shoulder: a prospective study of 100 shoulders. Am J Sports Med. 2006 Jul. 34(7):1061-71. [Medline]. Bradley JP, McClincy MP, Arner JW, Tejwani SG. Arthroscopic capsulolabral reconstruction for posterior instability of the shoulder: a prospective study of 200 shoulders. Am J Sports Med. 2013 Sep. 41 (9):2005-14. [Medline]. Williams RJ 3rd, Strickland S, Cohen M, et al. Arthroscopic repair for traumatic posterior shoulder instability. Am J Sports Med. 2003 Mar-Apr. 31(2):203-9. [Medline]. Kim SH, Ha KI, Park JH, et al. Arthroscopic posterior labral repair and capsular shift for traumatic unidirectional recurrent posterior subluxation of the shoulder. J Bone Joint Surg Am. 2003 Aug. 85-A(8):1479-87. [Medline]. Bottoni CR, Franks BR, Moore JH, et al. Operative stabilization of posterior shoulder instability. Am J Sports Med. 2005 Jul. 33(7):996-1002. [Medline]. Arner JW, McClincy MP, Bradley JP. Arthroscopic Stabilization of Posterior Shoulder Instability Is Successful in American Football Players. Arthroscopy. 2015 Aug. 31 (8):1466-71. [Medline]. Pollock RG, Barron OA. Posterior instability repairs. Warner JJP, Iannotti JP, Gerber C, eds. Complex and Revision Problems in Shoulder Surgery. Philadelphia: Lippincott-Raven; 1997. 71-84. Intraoperative examination under anesthesia of a patient with atraumatic posterior instability demonstrates, via a posterior drawer test, significant posterior subluxation of the glenohumeral joint. Physical examination of this patient with atraumatic posterior instability demonstrates significant posterior glenohumeral translation with the jerk test. 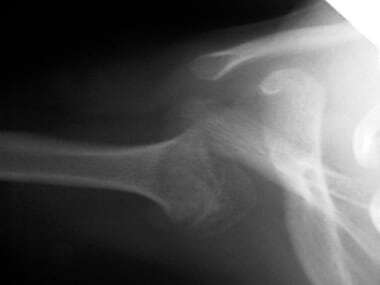 Anteroposterior radiograph of this shoulder demonstrates an impression defect in the humeral head; however, the posterior dislocation is not readily apparent on this view. 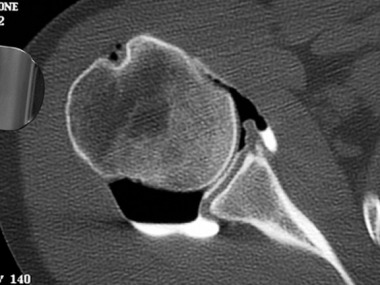 Axial cuts of the postreduction computed tomography (CT) scan demonstrate the anterior impression defect with persistent posterior subluxation of the humeral head. Because this elderly patient also had glenoid arthritis, ultimate treatment was total shoulder arthroplasty. Arthroscopic examination demonstrates significant capsular laxity with a large, redundant posterior recess. The posterior approach to the shoulder begins at the posterolateral border of the acromion and extends to the axilla. The capsule is exposed by splitting the deltoid in line with its fibers, followed by dissection of the infraspinatus/teres minor interval. A horizontal incision is then made in the capsule to expose the joint. A Fukuda retractor is inserted to retract the humeral head and expose the posterior glenoid rim. Suture anchors are inserted into the glenoid rim. The sutures are used to perform the capsulorrhaphy and are then tied. Completion of the procedure demonstrates significant reduction of the posterior capsular redundancy. Postoperative immobilization in a gunslinger brace demonstrates appropriate positioning in external rotation. Disclosure: Received consulting fee from Smith & Nephew Endoscopy for speaking and teaching.